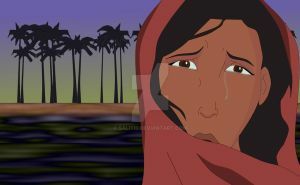 Another very old pic, showing the scene from Prince of Egypt when the pharaoh's daughter finds Moses in the Nile. I love this movie, it's an awesome animated movie. Even though they changed a few things, it's still amazing. This may sound weird, but I find Moses cute in this one, especially during "through heaven's eyes" to the end of the movie. This movie deserves more attention then it's getting. I'm religious and this is my favorite animated Bible movie. I liked it too, but I thought that the theme wasn't exactly appropriate for a 2D animation movie. Especially since there was that line that Zipporah should be taken to Prince Moses' bed... Hmm... It'd be fine in a live action movie, but in a cartoon? Never mind. I liked the songs a lot, especially the song of Moses's mum. Cartoons are not automatically for children. how lovely. i did a picture of tuya as well. ([link]) what do you think? Is Wonderful!! I love it!! OK I LOVE YOUR PICTURE! Love ancient Egypt and loooove this movie cuz it's not like the other movies were Egyptians have blond hairs, or weird clothes etc.! that she and Milla look alike. Nice with the fuzziness. uhm... i think she's not the pharoah's daughter but the queen... nice drawing btw..nice coloring! Originally it was Pharoah's daughter who found Moses, because Miriam and Jochavved got to nurse him when he was growing up, but in the movie they obviously thought it was better to use the Queen instead. It still works and it doesn't change much, in fact I think it rather helps things- it would have been too confusing if they'd used the princess. Oooh...okaay thanks^^ yay! I know a trivia from the movie!! woot! I love the movie because it's not god-damn disney. It is better made and more serious than any disney movie to this day. I love the historic/Biblical accurateness as well. As for ur pic, it is excellently made. I love ancient Egypt!! I have no problem with Disney. Actually, I love it. But Prince of Egypt too was good, although I thought that a biblical story like that wasn't the ideal topic for a cartoon. well your allowed ur opinion, as am I. PoE is way better than any disney movie except Lion King, and Fox and the Hound...the only Disney movies I like. I haven't even heard 'Fox and the hound'. Is that too a Disney cartoon? Ah, the only time I'll ever see my Hebrew name in print. Tziporah. This isn't Disney? Really? Very nice pic. Love the softness of it. I don't remember the whale, but I remember that the princess was singing a very beautiful song in this scene. Aw, amazing...I love the colouring. Great job! That movie has grandiose illustrations as well as a great storyline. I love it! It was also the most expensive animated film of all time...it took 200,000 working hours to get that fire tornado scene down pat! Isn't that crazy? Well great pic, it looks exactly like the characters! OO i love this movie, ima big disney fan. I loved that movie!! And what a beautiful pic!